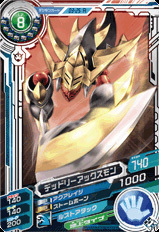 A younger brother who exchanged cups of brotherhood with Skull Knightmon, it is a brawny fighter replete with nimble movements and limitless physical strength. It faithfully obeys its sworn brother Skull Knightmon, and battles with faith in its sworn brother in order to obtain victory. It shows off lightning-speed movements fast enough that they earned it the alias "Running Lightning", and its top speed is so fast that it leaves afterimages. However, fine maneuvers are its weak point, so not only are its linear movements easily read by its opponent, it easily collides with obstacles too. However, if you see its sturdy body smashing through obstacles as if they were nothing and continuing to run with a defiant, thunderous roar, you would probably agree that the name "Running Lightning" is appropriate for it. Its Special Moves are running between opponents at the speed of light, who aren't even able to realize before they're cut down (Air Slicer), and spewing a powerful solution that dissolves everything (Aqua Rage). Furthermore, it has an even stronger technique, "Aqua Regia", in which it liquefies itself and swallows up everything in its surroundings. 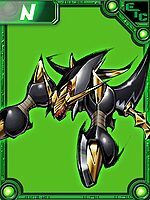 A younger brother who exchanged cups of brotherhood with Skull Knightmon, it is a brawny fighter replete with nimble movements and limitless physical strength. It faithfully obeys its sworn brother Skull Knightmon, and battles with faith in its sworn brother in order to obtain victory. It shows off lightning-speed movements fast enough that they earned it the alias "Running Lightning", and its top speed is so fast that it leaves afterimages. However, fine maneuvers are its weak point, so not only are its linear movements easily read by its opponent, it easily collides with obstacles too. However, if you see its sturdy body smashing through obstacles as if they were nothing and continuing to run with a defiant, thunderous roar, you would probably agree that the name "Running Lightning" is appropriate for it. Its Special Moves are running between opponents at the speed of light, who aren't even able to realize before they're cut down (Air Slicer), and spewing a powerful solution that dissolves everything (Aqua Rage). A younger brother who exchanged cups of brotherhood with Skull Knightmon. It is a brawny fighter replete with nimble movements and limitless physical strength. 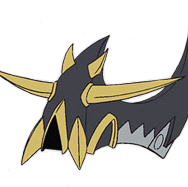 It shows off lightning-speed movements fast enough that they earned it the alias "Running Lightning". Its Special Moves are running between opponents at the speed of light, who aren't even able to realize before they're cut down (Air Slicer), and spewing a powerful solution that dissolves everything (Aqua Rage). 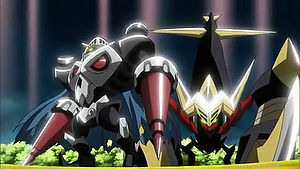 Skull Knightmon and Deadly Axemon DigiXros into Dark Knightmon. 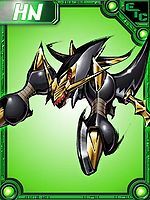 A younger brother who exchanged cups of brotherhood with Skull Knightmon, it is a brawny fighter replete with nimble movements and limitless physical strength. It faithfully obeys its sworn brother Skull Knightmon, and battles with faith in its sworn brother in order to obtain victory. 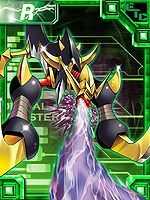 Its Special Move are running between opponents at the speed of light, who aren't even able to realize before they're cut down (Air Slicer), and spewing a powerful solution that dissolves everything (Aqua Rage). 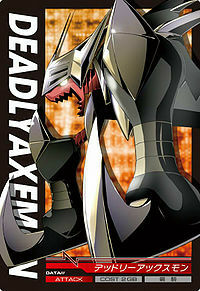 Title: 「走る稲妻」 — "Running Lightning"
Anime/Manga Digimon Xros Wars: "Legendary Deckerdramon, Stir!" Liquefies itself into acid and swallows up its surroundings. Runs at the speed of light to cut down opponents. 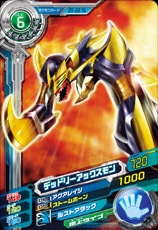 Possessing the alias 'Running Lightning', it trifles with the opponent using its speedy movements, moving at lightning speed just as its alias suggests. 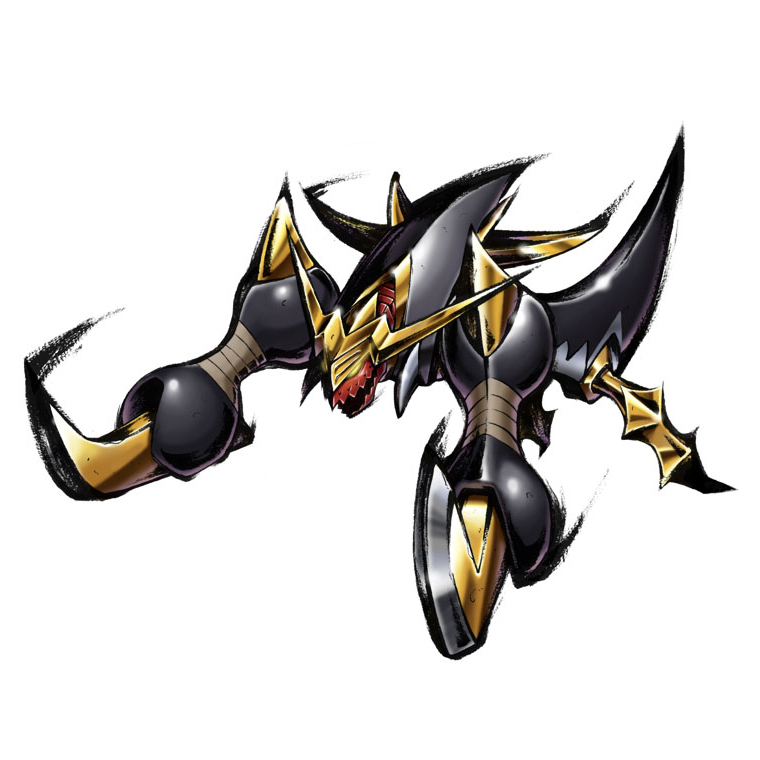 A Digimon that doesn't lose to anyone when it comes to speed. 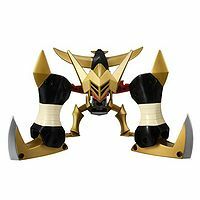 Its sturdy body pulverizes any obstacles in its way that it is unable to maneuver around. Its "Air Slicer" is a Special Move where it sprints around the opponent at extraordinary speed, slicing them apart before they can even feel pain. A robust warrior, it is loyal to its sworn brother Skull Knightmon. It is capable of charging straight on at an overwhelming speed. 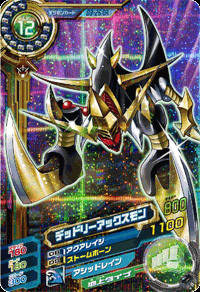 A younger brother figure that exchanged cups of brotherhood with Skull Knightmon. Filled to the brim with infinite stamina, it is also referred to as the Lightning Streak due to the linear but light-speed way it moves and pulverizes anything it hits. ↑ Digimon Xros Wars: "Little Brother, Why!? 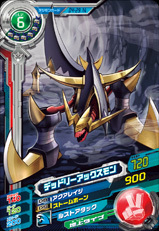 The Nightmare of Enemy General Yuu"
↑ Digimon Xros Wars: "Legendary Deckerdramon, Stir!" This page was last modified on 9 October 2018, at 16:35.